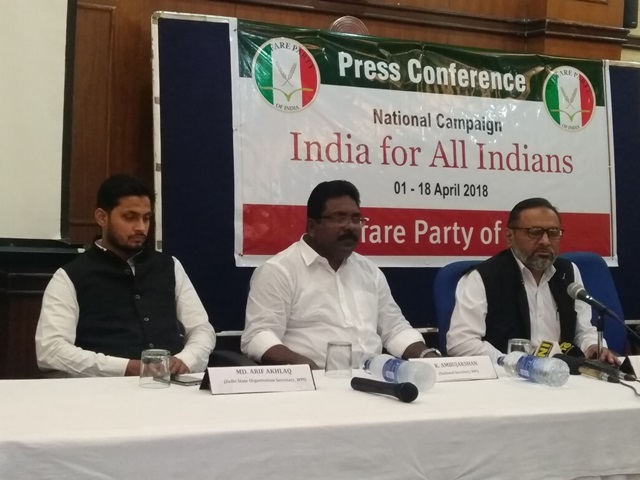 New Delhi, 31 Mar 2018 [Fik/News Sources]: In the wake of growing attacks on Dalits, Muslims and weaker sections and politics of hate and polarization, the Welfare Party of India on Friday announced a nationwide agitation under the slogan “India for all Indians” from April 1 to 18. It said in the last four years, the government did nothing to fulfill the promises it made with the people for coming to power and to rein in anti-social elements and groups affiliated to the ruling party. Briefing the media about the forthcoming campaign, Dr. S. Q. R. Ilyas, National President WPI, said the Modi government failed on all account as common man’s sufferings have increased manifold. Since this government came to power, country witnessed unprecedented atmosphere of intolerance, attacks on Muslims and Dalits and incidents of communal violence increased manifold, he said. Organized communal riots allegedly with the support of the ruling class are on the rise ever since the BJP came to power at centre and in states and are clearly intended to fill fear in the minds of minorities, he added. In such a alarming situation, the Welfare Party cannot remain silent and idle, it has decided of launching a country-wide agitation against these injustices, Dr Ilyas said. In response to a question, Dr Ilyas said the party has invited all like-minded secular parties including Congress, NCP, CPM, RJD, SP, BSP, and others and social activists for the campaign. Speaking on the occasion, Welfare party‘s National secretary Ambujakshan said the Modi government has been trying to deflect public attention from its failures by raking trivial and emotional issues. On the controversy over the name of Dr B R Ambedkar, Ambujakshan said the historical fact cannot be changed by adding Ramji to Dr Ambedkar’s name. He said Dr Ambedkar had not only left Hindu fold but he had advised his followers not to remain in the Hindu fold as they cannot get any justice who penned down the book “Riddles in Hinduism”. Those who are now championing the cause of Dr Ambedkar had burnt his book “Riddles in Hinduism’ in 1988, Ambujakshan said. Outlining the multi-dimensional programs for highlighting the dismal picture of the present government, Dr Ilyas said during the agitation, we would also demand of repealing all Draconian Laws, due representation for Muslims in parliament and legislative assemblies, reverting back to ballot papers system and declaring Racist abuse against Muslims as a Crime and Ensure Social dignity of Dalits and Adivasis. The 18-day agitation will conclude at Parliament Street on April18 in New Delhi with an impressive rally which is the Foundation Day of the Welfare Party, he said. Various Political leaders, eminent socio-cultural activists will address the gathering.